Common Agama male basking on a boulder near Lake Bogoria, Rift Valley, Kenya. 7 October 2010. From Wikipedia: The Common Agama, Red-headed Rock Agama, or Rainbow Agama can often be seen in the heat of the day. In the breeding season, the males develop dramatically colorful markings, the head and neck and tail turning bright orange, and the body dark blue. Outside of the breeding season, the male is a plain brown. The females and juveniles are always more cryptically marked. 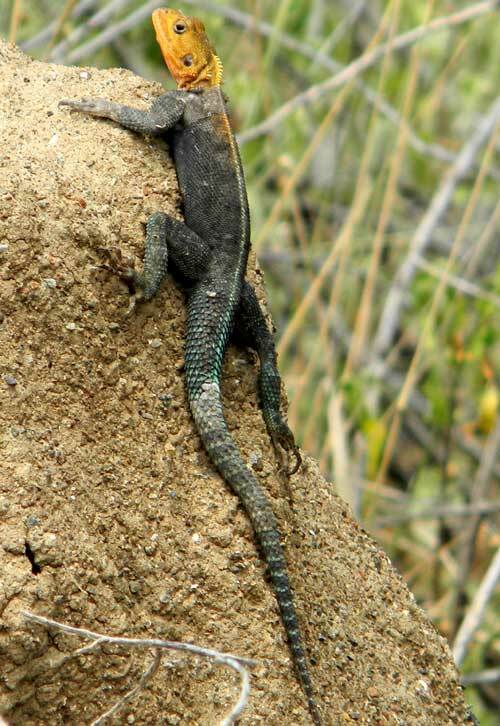 This lizard can be found climbing rocks and walls. Its primary source of food is insects. The males are territorial claiming small to medium patches of land which they defend against other mature males. Juveniles and females reside within the territories unchallenged. The mature males become agitated when confronting each other; nodding vigorously, arching, skipping sideways, and clashing tails. The loser is chased out of the territory. Also, during mating season, males tend to do "push-ups" after every few steps in order to attract females. 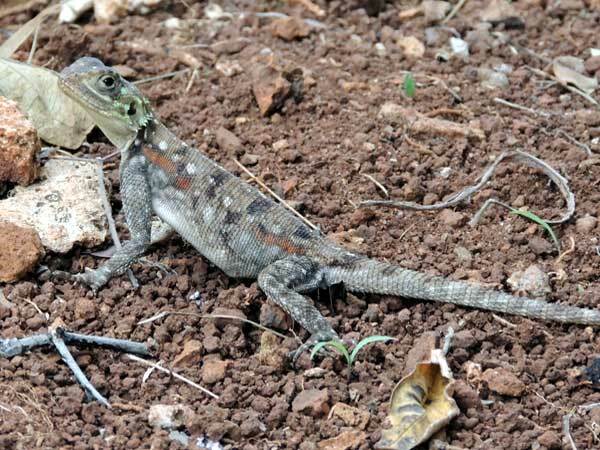 Common Agama female or immature basking in Nairobi, Kenya. 26 March 2013.